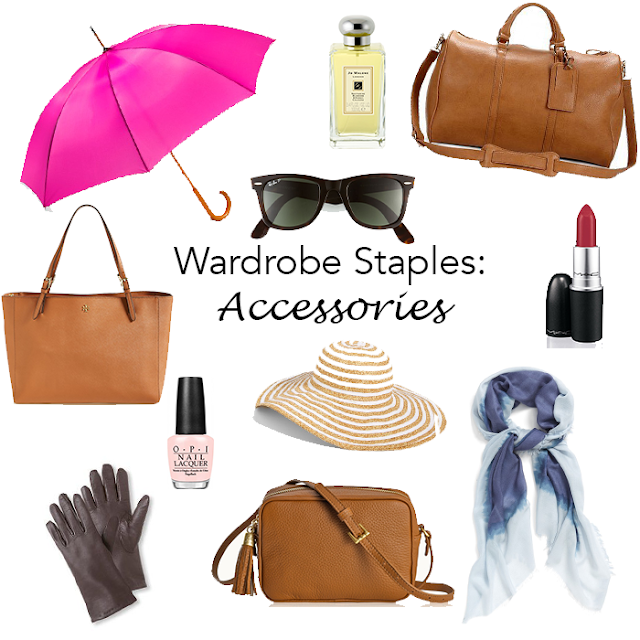 It's time for the third installment in the wardrobe staples series, which is all about accessories! I'm going to preface this post by saying some of these accessories require a little effort to find what works for you. Like jewelry, accessories are pretty personal, just in a different way. You may absolutely love something, but that doesn't necessarily mean it loves you. But don't worry, you will find your signatures, and then you'll have something that's all your own! Red Lipstick // It's fun to adventure with different lipsticks, but there's nothing like having your own shade of red. It took me a while to find my perfect color, so I highly recommend going to a makeup counter to try lots on. My favorite lipsticks are MAC, and my red is Russian Red. It's close to a true red, because orangey-red definitely does not look good on my pale complexion. Side note: I always put on my favorite chapstick prior to my lipstick. Signature Scent // Just like your own shade of red lipstick, a signature scent is definitely something every woman should have. I used to be quite adventurous with my perfume, and by that I mean B.Spears was the absolute authority in fragrance, but the older I get, the more I want a simple scent that I can wear every day without smelling like I tried the whole perfume counter on. With so many fragrances out there it can be really hard to find the one that works for you. Jo Malone organizes their scents into different categories like fruity, floral, spicy, etc. and by their intensity. You really can't go wrong, no matter what your preference, and if you can't find exactly what you're looking for, they can help you layer to create your own! Another one of my favorites is Chanel Chance. Sunnies // My face shape is considered round, so there are definitely styles I cannot pull off. I know sunglasses don't work for me when Kyle tells me that I look like a giant bug - a bug's life just isn't for this girl. The pair I wear most frequently are the wayfarers, but I also throw my aviators and clubmasters into the mix. Go-To Manicure // It may seem odd to consider your manicure as an accessory, but these days, your nail color is just as important as the bag you're carrying. It may be fun to try out all the new trends, but sometimes you just don't want to stare at the "color wall" for 30 minutes. My favorite, OPI's bubble bath, is the perfect sheer pink that looks good on a ton of different skin tones. Straw Hat // Wrinkles aren't a good look on anyone. Sun protection is something that's super important to me, so having a wide brimmed straw hat is a necessity anytime I'm out in the sun. This one from J.Crew on sale for less than $30! Leather Tote // I don't know how anyone survives without a good leather tote in their handbag rotation. From work to everyday to-and-from, they're great for holding just about anything you may need. I've mentioned this one from Madewell quite a bit, and they restocked them in the color brown that I have. There are also great faux leather options like this one, that comes in a lot of colors and reversible! Cross-body bag // Sometimes you just don't need to carry the kitchen sink with you. The one I've linked has been on my wish list for quite some time, but I just can't decide between that one and this one from Lo & Sons. This Kate Spade comes in some gorgeous colors if you want a more fun option! Large Scarf/Wrap // The only way this would have been on my list a few months ago is if you showed me a light airy version that MIGHT not make me break a sweat mid-December in Texas. Now, I'm all about finding the biggest, warmest looking scarf I can find to prepare for this little thing called "winter". This little gem made it's way into my closet the other day, and here's another great option from the Nordstrom Anniversary Sale. Weekender Bag // I love the size of these bags because it's just enough for a weekend getaway. They keep me from overpacking and make traveling a lot easier. I highly recommend finding one that fits carry-on size restrictions. This one will coordinate with the Madewell transport tote, and if leather isn't your thing, this canvas one is fabulous. Umbrella // This may seem like the most random item on this list, but depending on where you live, you might need one of these on a daily basis. This one is a super inexpensive and fun option from Target, and I actually used a pink trimmed one for some of our wedding pictures! Side note: it definitely rained cats and dogs on our wedding day! Gloves // Depending on where you live, you may think I've lost my mind with this one, but if you have to be outside in the cold for any amount of time, gloves are a life saver. These are a sportier option. Both of the ones I've linked are tech enabled, which these days is an absolute must. Like I said, finding your signatures may take a little time, but have fun while you're looking! Grab a girlfriend who's opinion you trust and make your way through the department store counters and hopefully you'll both walk out with a few new wardrobe staples!